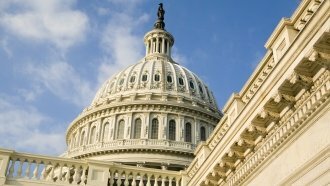 Congress just released the text of a bipartisan funding bill that would secure money for the government through Sept. 30. Now it has to pass it. House Republicans have released the text of a funding bill they want passed to avoid yet another government shutdown this year. Congress has to pass something, and the president has to sign it by midnight Friday in order to avoid another temporary outage in Washington. The bipartisan proposal, which House Republicans released Wednesday night, is a $1.3 trillion deal to keep the government going through Sept. 30. It could be voted on in the House as early as Thursday, which would give the Senate a day to act. Senate Minority Leader Chuck Schumer said the Democrats feel good about the bill. Republican leaders were at the White House on Wednesday, reportedly to sell the president on the bill. His border wall would only get a fraction of the funding his administration has asked for. The bill doesn't address DACA, but it does include the Fix NICS Act, a provision aimed at strengthening the federal background check system for buying firearms. It also includes a roundabout way to secure funding for a rail project connecting New York and New Jersey. President Donald Trump had threatened to veto the spending bill if it included funding for that project.